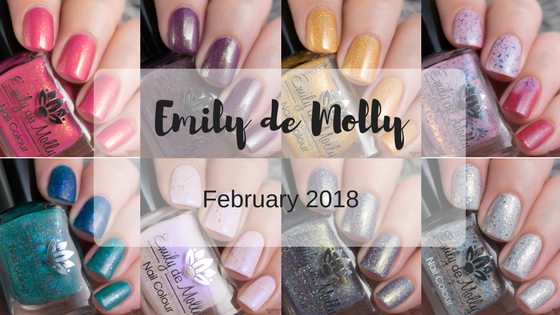 It's the first full release from Emily de Molly for 2018 and things are looking bright! Eight new shades filled with shimmer, holo glitters, and flakes in a rainbow of colours. 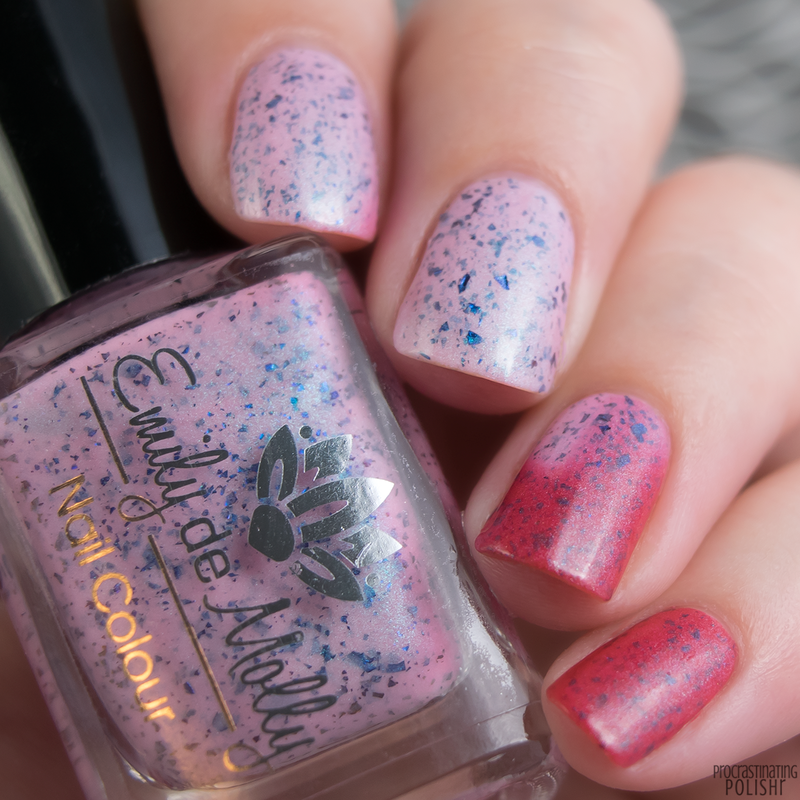 There's two thermals for fans of a good transition and a range of finishes so you're bound to find a new polish crush! 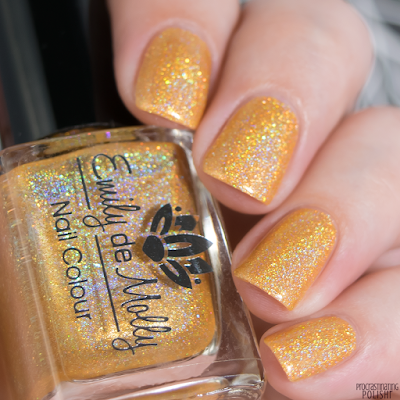 A honeycomb yellow holo with silver micro glitters. I had no idea how to describe the colour until I saw Hayley had described it as honeycomb and it's totally spot on. 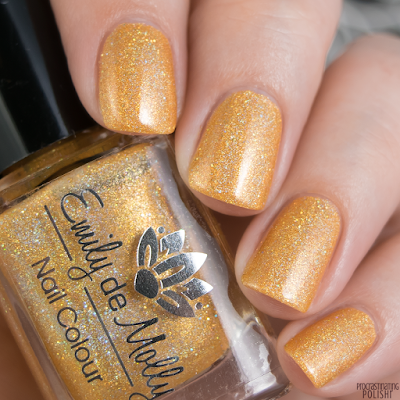 It's glowy and golden with a beautiful warm tone with a great balance of holo and glitter. Gorgeous formula - easy to apply and a beautiful consistency. It's super opaque in one coat but I'd recommend two for full coverage. There's also surprisingly little texture despite the micro glitter, but I'd still recommend a thicker style top coat for this one. 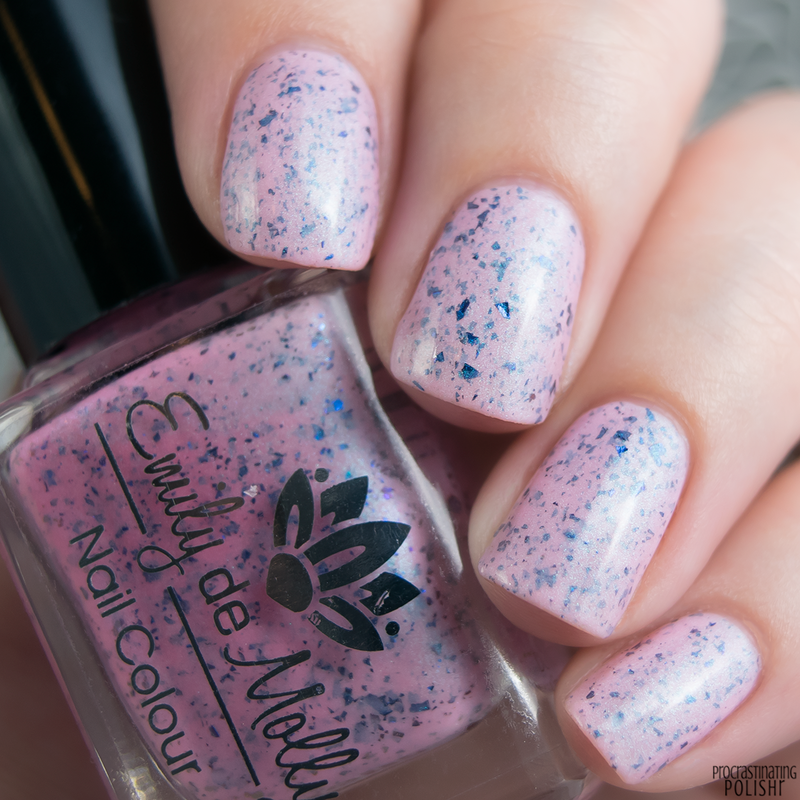 Super pale pink with a beige undertone with copper flakes, silver micro glitter and a wild violet shimmer. I am completely and utterly obsessed with the copper flakes, they're such an unexpected but totally perfect addition. The shimmer is incredible, just glows non stop. This felt a little chalky to apply and the first coat was quite streaky, but by the third coat it had built up to a nice opacity and beautiful level finish. 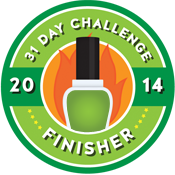 It dries to a satin style finish but it benefits from a glossy top coat. Bright medium pink with gold shimmer and gold flakes. Simple, but stunning. The combo of gold shimmer and flakes makes it feel extra luxe, I adore it - yes, this is me proclaiming my adoration for a pink polish! There's a huge amount of flakes in this but the formula is still really good to work with, everything applie evenly and self levels well. It was borderline opaque at two coats, so I did a third for photos. This one also dries with a satin type finish. 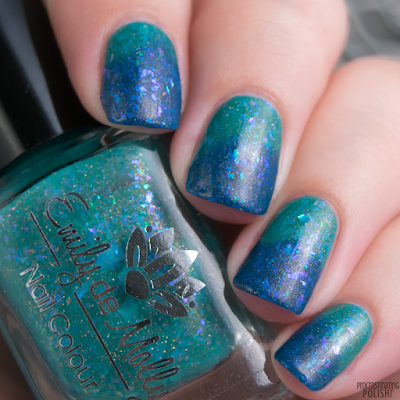 It has a little bumpiness from flakes - easily smoothed out with a thicker style top coat. Jade to royal blue thermal jelly/crelly with copper micro glitter, copper shimmer and iridescent flakes. Jade is the warm state and blue is the cold state - I found it super hard to get a nice transition shot as it's right in the middle of summer here and it's been super hot so the moment I strayed from ice water it switched back to jade too fast! 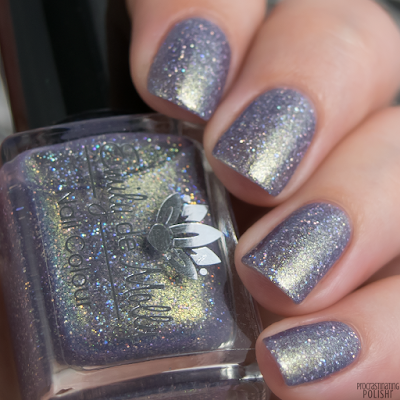 The flakes are totally gorgeous and the shimmer is subtle but gives such a cool glow. The formula is nice, I found using medium coats gave me better results than my usual thin coats. It was almost opaque in two coats, but I did a third and don't regret it. The flakes are quite big and may need some coaxing into place but overall I didn't find them too problematic. You'll definitely need a good thick top coat to ensure everything is smooth. Silver holo with iridescent flakes and black micro glitter. 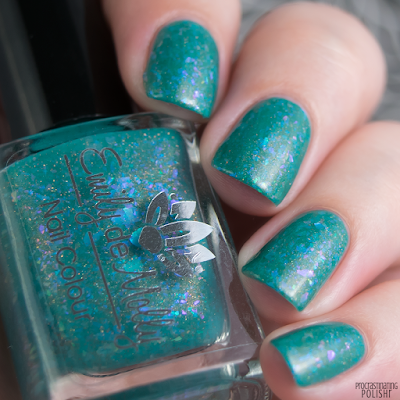 I was super unsure about this in the bottle - micro glitters and flakes in a holo base can be hit or miss, but this one HIT. Everything feels well blended and the finish is glowy and super cool. The black glitters in particular make for a really different finish, kinda futuristic and gritty (not texture gritty though!). 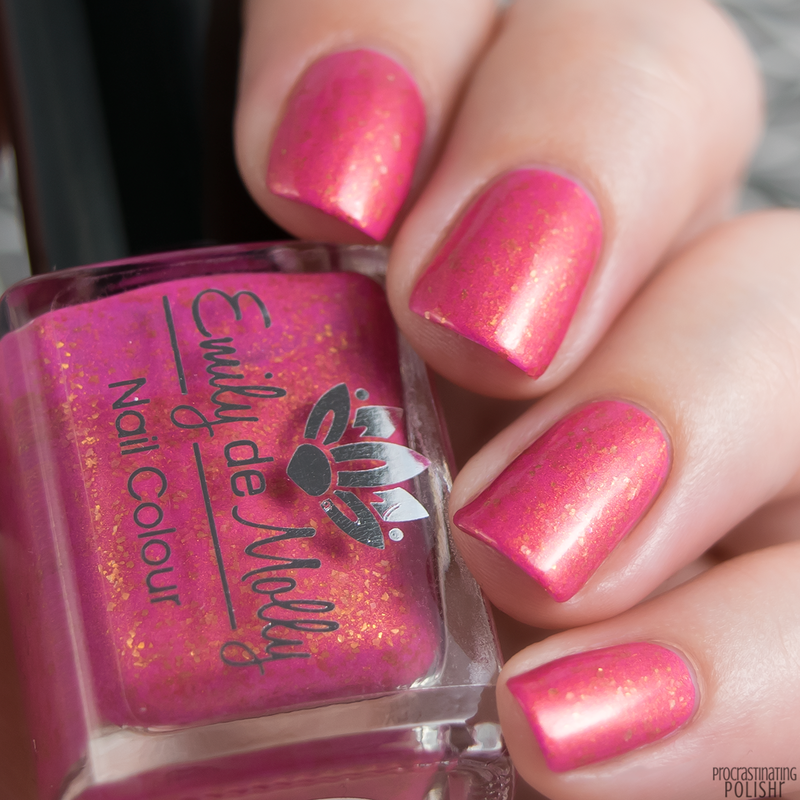 The formula is fantastic, really smooth and easy to apply and it's opaque in two coats. The flakes can give a slightly bumpy appearance so use a thicker top coat - I promise it won't dull the holo! 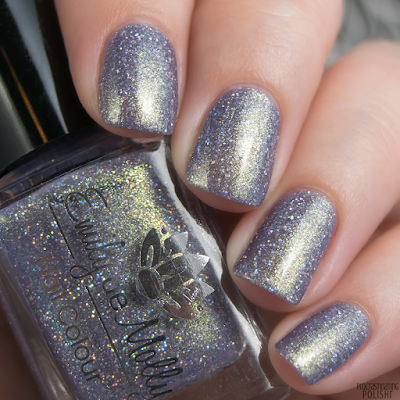 An incredibly shimmering silvery mauve filled with holo micro glitter. The shimmer is a green to gold shifter that crackles with light while the holo micro glitters twinkle and glow. It's a total stunner and a very unexpected favourite for me! Even with the heavy load of micro glitter this was really nice to apply. 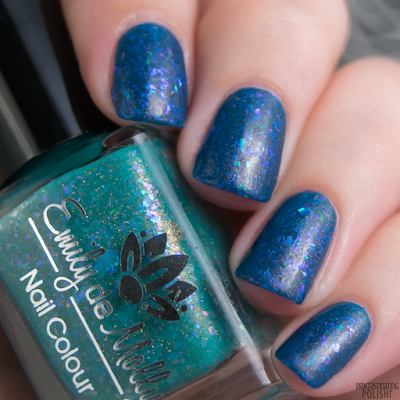 It doesn't have the usual gritty feel of a micro glitter polish, and the natural finish is surprisingly smooth. It's also beautifully pigmented, opaque in two coats. 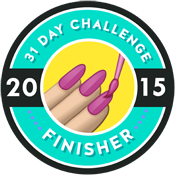 Use a thick top coat for a super smooth finish. Pale pink to berry red thermal with blue chrome flakes and subtle turquoise shimmer. I'm always impressed with thermals that go from one extreme to another like this one - when it's warm it's a pale, almost sheer pink, and when cold it's a rich and deep berry red. I had trouble capturing the transition on this one again thanks to sweltering summer heat, but I got a few snaps of the cold state! This has a gorgeous formula that applies beautifully. I was surprised to find it was opaque in two coats, the pale warm state has a sheer appearance without actually being translucent. I noticed some flakes peeking out through my top coat as I was taking photos (I used a thinner one thinking it would be ok), use a good thick top coat to ensure a super smooth finish. Red based plum with copper micro glitter, gold flakes and a golden green shimmer. I couldn't capture the shimmer on camera very well but it's absolutely incredible! The flakes and micro glitter give pops of beautiful warm sparkle that contrast perfectly against the luminous shimmer. This is a feast of contrast and I loooove it! The formula is ever so slightly thicker than I like but it still applies really well - the thickness helps keep the flakes in check. Though it self levels well I'd recommend a thicker top coat with this one, just to help smooth out any bumps from the flakes and glitter. 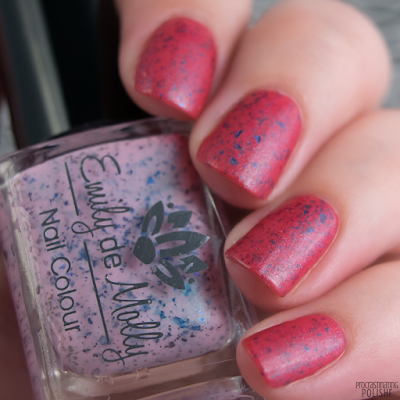 So there you go, another incredible release from Emily de Molly - how do you pick a favourite when they're all so incredible? I narrowed it down to four absolute must haves below! These eight new shades will be available from 6pm AEDT Friday 9th February (that's 10am EST Saturday 10th Feb for US customers), along with a handful of awesome Limited Edition shades. 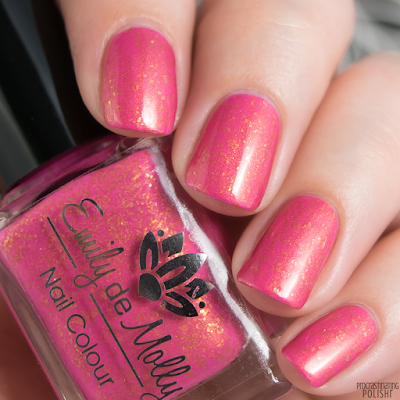 Head to Emily de Molly to snap up your faves!